Unsalted butter is a dairy product made from churned or fermented cream or milk. It is sometimes labeled as "sweet butter" because it has no salt to counteract the naturally sweet taste; however, because of the absence of salt, a natural preservative, unsalted butter is more perishable. Solid when refrigerated, soft at room temperature, it liquefies with very little heat. Although it is mostly fat, it contains some water and some solids. It is exactly the same as salted butter (which is more common) in color and texture. Buying: Available at most grocery stores and markets, frequently sold side by side with salted butter. 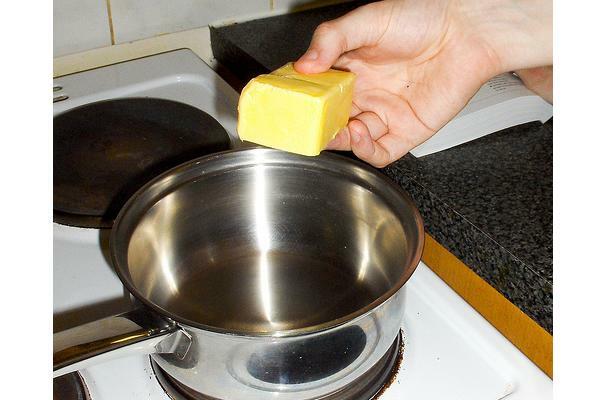 Unsalted butter is used in much the same way as salted butter, except that it allows an added degree of control of the salt content of the final dish. Many chefs prefer unsalted butter in cooking for this reason. In applications where the precise salt content is not important, there is essentially no difference. Butter is primarily fat, and as such it is used like vegetable oil or lard in cooking. It has a relatively low smoke point, and should not be used for very high heat cooking like deep frying. Butter is essential in french sauce making, and the fact that it combines fat and water makes it well suited to finishing sauces which contain both, and helping to incorporate them rather than allowing them to separate. Keep butter in the refrigerator until it is needed. As it is mostly fat, it will keep very well, but the milk solids can turn rancid. Follow instructions and use by dates on packaging. Butter can also be kept much longer if frozen. I've heard that unsalted butter is of a finer quality than salted because producers know that salt obscures the taste of lower quality ingredients and therefore reserve higher quality cream for unsalted butter.